Stony Rapids is a small municipal hamlet in the extreme northern part of Saskatchewan. The community is located 82 kilometres (51 mi) south of the Saskatchewan and NWT border. The community is adjacent to the Fond du Lac River which connects to Fond-du-Lac, Uranium City and Camsell Portage downstream. Like most northern communities, Stony Rapids relies on air for vital year-round transportation. 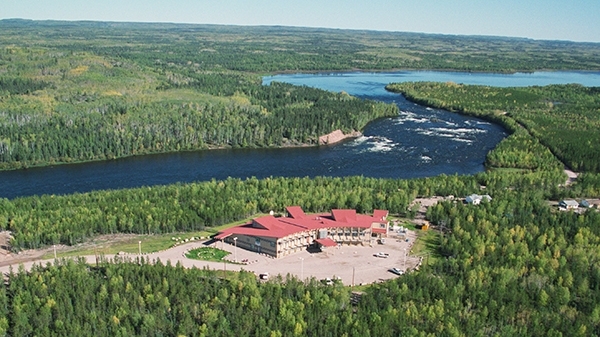 The community plays host to the Stony Rapids Airport which also serves the nearby community of Black Lake. An all-weather gravel road reaches from Stony Rapids to Points North as well as to Black Lake, 20 kilometers southeast. A winter ice road from Fond-du-Lac and Uranium City is available for most of the winter. The community of Stony Rapids has a population of approximately 300 people, many of whom are members of the Black Lake Denesuline Nation. Most residents speak Dene and English. The school program is from kindergarten to grade nine and students either travel to Black Lake by bus or are sent south to attend high school. The Athabasca Health Facility completed in 2003, is located on reserve land (Chicken 224) of the Black Lake Dene Nation which is adjacent to Stony Rapids. The facility provides health care services to communities within the Athabasca region. In June, 2016 the community of Stony Rapids, along with the First Nations of Black Lake, Fond du Lac and Hatchet Lake, and the three communities of Wollaston Lake, Uranium City and Camsell Portage signed a historic collaboration agreement with Cameco and Orano (formerly AREVA Resources). The Yá thi Néné Collaboration Agreement is designed to enhance workforce and business development, environmental stewardship and community investment in the Athabasca Basin. The Yá thi Néné Joint Implementation Committee has released a 2017 Report to Community Members outlining progress made from the date of signing to the end of the year.